During Spring 2018, students in West Chester University's Immigration and Digital Storytelling course produced projects exploring the stories of immigrants who arrived in Philadelphia near the turn of the twentieth century. Each project draws directly on the words of elderly Philadelphians reflecting on childhood and young adulthood, and how they navigated their way through the city, Prohibition, corrupt politics, nativism, poverty, and child labor. The Stetson Hat Company factory anchored the South Kensington neighborhood near Montgomery Avenue and Fourth Street, forming a small company town with its own hospital, building & loan association, schools, sports teams, and a strong sense of corporate paternalism. Oral history interviewees fondly remembered their work lives at Stetson's at a time when it was considered one of Philadelphia's best work places. The Influenza Pandemic of 1918 hit Philadelphia harder than any other American city, with 12,000 dying from the virus that swept the globe at the end of World War I. 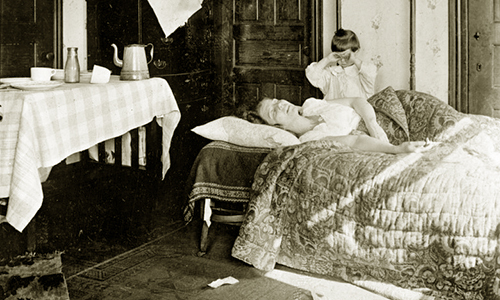 Oral history interviewees recalled how families and neighborhoods dealt with the flu, remembering it from the perspective of young people confronted with loved ones' lives cut short in a city where fears of contagion were ever present. This project explores how immigrant families in Philadelphia took care of one another as they tried home remedies and buried the dead. 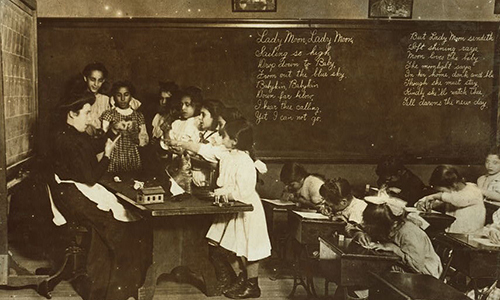 When immigrants arrived in Philadelphia in the early twentieth century, they arrived with a broad of work skills and educations, typically spoke little if any English, and settled in overlapping mosaics of ethnic enclaves. Did they retain their ethnic identities, or did they begin to Americanize? The answer is both. This project, anchored by a short documentary narrated by the words of oral history interviewees, explores the challenges of assimilating while retaining ethnic identity. One of immigrants' motivations to come to Philadelphia was the promise of work—the ability to earn good wages to support their families. 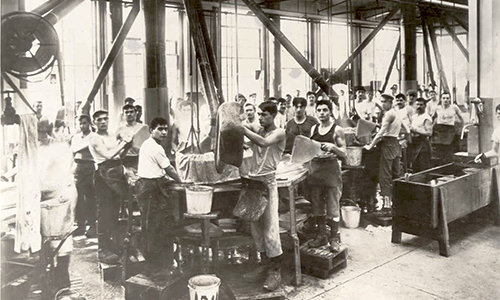 Immigrants worked in a variety of industries during the early 20th century, when the city was known as "The Workshop of the World." With immigrant children often quitting school as teenagers to work in factories and shops, work life shaped their existence from an early age. This project maps oral history excerpts and images to work sites on the crowdsourced world map, HistoryPin. By the end of the 19th century, Russian Jews comprised the largest foreign-born population in Philadelphia. South Philadelphia's Jewish population then doubled to around 100,000 between 1907 and 1920. Fleeing persecution amid the strife of the Russian Revolution, many of these immigrants found work in Philadelphia's thriving garment industry, while others opened their own businesses. This project traces the journeys of some of those Jewish immigrants, following their search for the American Dream.